This research was undertaken to investigate the validity of concerns about whether chronic exposure to radiofrequency electromagnetic fields (RF-EMFs) emitted from mobile phone base station antennas could cause adverse health effects. The aim of this study was to identify possible adverse health effects among the residents of a condominium on which a mobile phone base station with sets of antennas operating at two different frequencies had been mounted. This research was conducted without outside funds in order to maintain neutrality and avoid pressures from external sources. 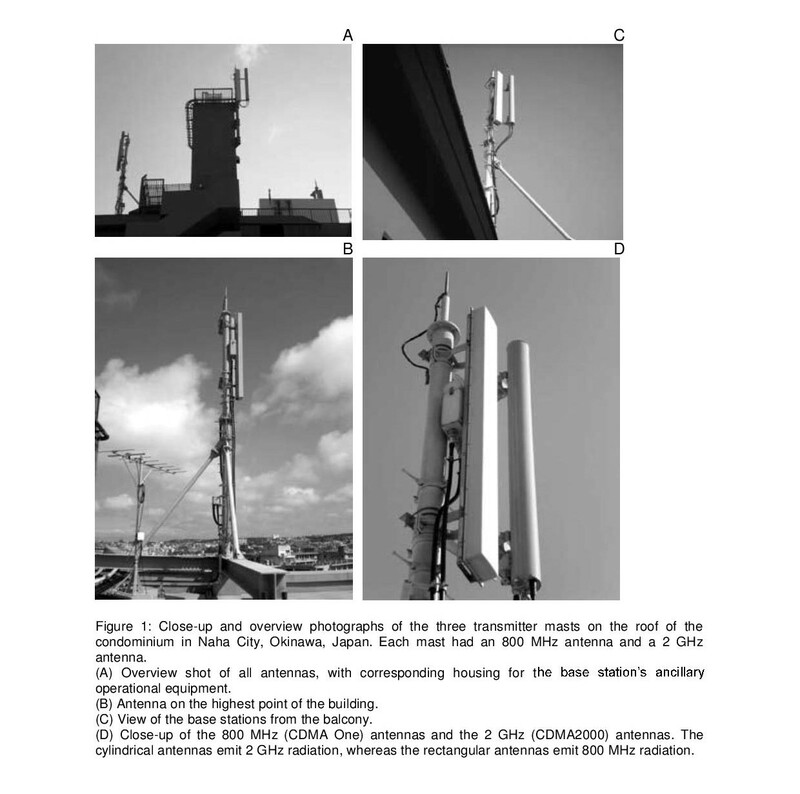 Methods: We investigated possible adverse effects on the health of condominium inhabitants who were exposed from 1998 to 2009 to the radiation from mobile phone base station antennas installed on top of their condominium. To accomplish this, in January and November 2009, 107 of 122 inhabitants were interviewed and underwent medical examinations. The first examination was carried out while the base station was in operation, the second examination three months after the base station antennas were removed once and for all. Based on the health examination results, the residents’ health and its changes during the operation of the antennas and after their removal were compared. Results: In several cases, significant effects on the inhabitants’ health could be proven. The health of these inhabitants was shown to improve after the removal of the antennas, and the researchers could identify no other factors that could explain this health improvement. These examinations and interviews suggest that there are possible adverse health effects related to RF-EMF exposure among people living under mobile phone base stations. 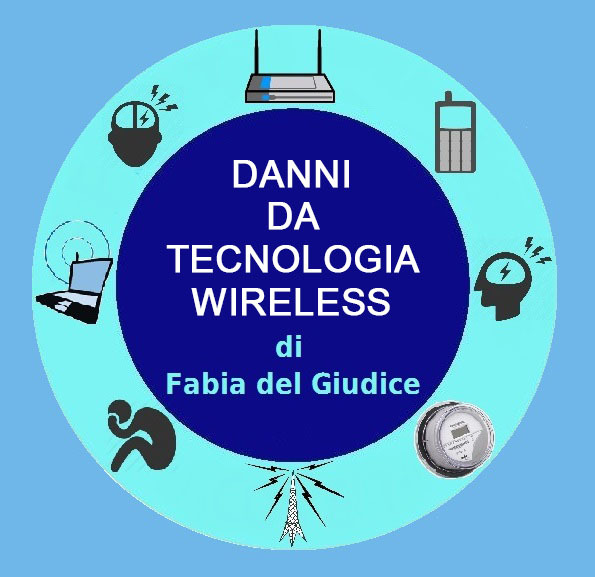 Conclusions and recommendations: The results of these examinations and interviews indicate a connection between adverse health effects and electromagnetic radiation from mobile phone base stations. Further research and studies are recommended regarding the possible adverse health effects of RF-EMFs. These results lead us to question the construction of mobile phone base stations on top of buildings such as condominiums or houses. 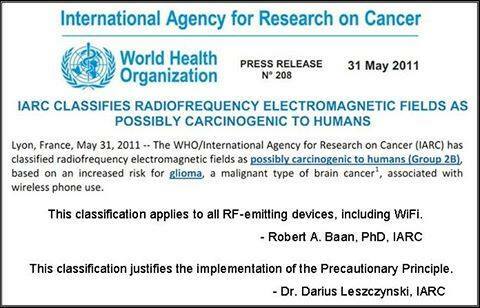 In 2011, the International Agency for Research on Cancer (IARC), a subsidiary body of the World Health Organization (WHO), officially declared radiofrequency electromagnetic fields (RF-EMFs) as possibly carcinogenic and a potential risk factor for gliomas and acoustic neuromas (IARC 2011). Moreover, it recommended taking precautionary measures to reduce exposure during mobile phone use, such as texting and the use of hands-free devices instead of holding the mobile phone next to the ear when talking. However, the WHO has not issued any recommendation yet regarding adverse health effects of RF-EMFs emitted from mobile phone base stations. If there are health problems related to RF-EMF emitted from mobile phones, would the RF-EMFs from a mobile phone base station have the same effect? Mobile phone base stations constantly send signals to many mobile phones. Because of that, people living near base stations can be exposed to RF-EMFs 24 hours a day all the year (Khurana 2009). Today, there are a number of published studies concerning the impact of RF-EMFs emitted by base stations (Berg-Beckhoff et al. 2009, Blettner et al. 2009, Abdel-Rassoul 2007, Hutter et al. 2006, Eger et al. 2004, Wolf & Wolf 2004, Navarro et al. 2003, Santini et al. 2003). Some of these studies indicate possible health hazard to those living close to base stations (Berg-Beckhoff 2009, Blettner et al. 2009, Navarro et al. 2003, Santini et al. 2003). Some show a higher incidence of cancer (Eger et al. 2004, Wolf & Wolf 2004) or a higher cancer mortality (Dode et al. 2011). Hutter et al. (2006) reported that the stronger the RF-EMFs are, the higher the incidence of headaches and attention deficit disorders. Reduced cognition has also been documented (Abdel-Rassoul et al. 2007). However, when studies like these are conducted on base stations, biases such as low frequency radiation (LF-EMF) and RF-EMF from the domestic living environment arise. Therefore, the more meticulous the research methodology is, the less significant the results indicated by the research. To get more precise results, it is necessary to eliminate biases as much as possible and to use double-blind procedures. However, conducting such research is difficult in reality. In Japan, the Ministry of Internal Affairs and Communications does not recognise any non-thermal effects from non-ionising radiation. Furthermore, the possibility of adverse health effects is not accepted by that Ministry when power densities are below 1000 μW/cm2 (1.8-5 GHz) (MIC 2011). There are no official reports on the possible adverse health effects of RF-EMF emitted from mobile phone base stations in Japan. Risks and hazardous effects associated with these stations are not officially recognised in Japan. Reports about the risks of mobile phone base stations are seldom in the Japanese print and broadcast media. A reason for this could be the mobile phone companies’ media sponsorship. In 1998, a mobile phone base station was installed for the first time on the roof of the condominium in Naha City, Okinawa, Japan that is being investigated. Its antennas had an 800 MHz operational frequency [800 MHz code division multiple access (CDMA One)]. At the end of 2007, a further set of antennas with an operational frequency of 2 GHz (CDMA 2000) was installed. These were activated in March 2008. Figures 1A-D show the antenna installations on the condominium roof from different perspectives. After the company owning the condominium withdrew its consent, the base station had to be removed. In June 2009, the 800 MHz installation was deactivated. It had been in operation for 11 years. The 2 GHz (CDMA 2000) antennas were deactivated in February 2009. They had an RF-EMF emission period of 11 months. The final removal of both the 0.8 and the 2 GHz antennas took place in August 2009. So there are two comparable time periods for comparing the symptoms before and after the residents’ exposure to the 2 GHz radiation. 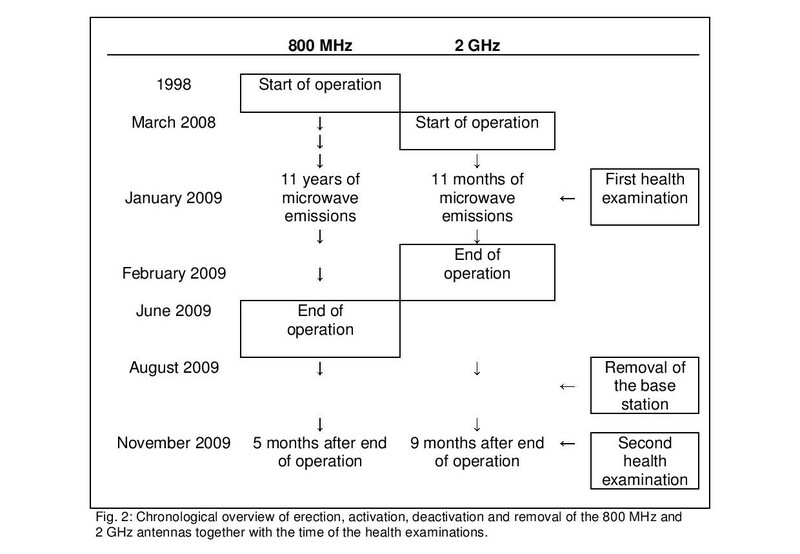 Figure 2 shows the chronological sequence from the erection of the base station to the removal of both sets of antennas and the timings of the medical examinations. In January 2009, the first medical examinations and interviews with the inhabitants were carried out whilst the base station was fully operational. A second set of examinations was conducted in August 2009 after the removal of the base station. These examinations and interviews compared the health of 107 residents during the base station’s operation and after its removal. The residents had no prior knowledge about possible adverse health effects of RF-EMFs. A physician and a nurse, who had both more than 20 years of clinical experience, conducted face-to-face health examinations. Before the interviews, the residents had filled out health questionnaires distributed by the physician. Inhabitants of 39 out of 47 apartments participated. Vacant apartments and inhabitants who refused to participate were excluded from the study. 107 out of the 122 individuals who answered the questionnaires were interviewed. When interviewing the inhabitants about symptoms, the time of the first appearance of symptoms was taken into account. Health problems appearing between 1998 and March 2008, shortly before the installation of the 2 GHz antennas, were recorded as symptoms associated with radiation emitted from the 800 MHz antennas. Health problems appearing after the activation of the 2 GHz antennas, i.e. 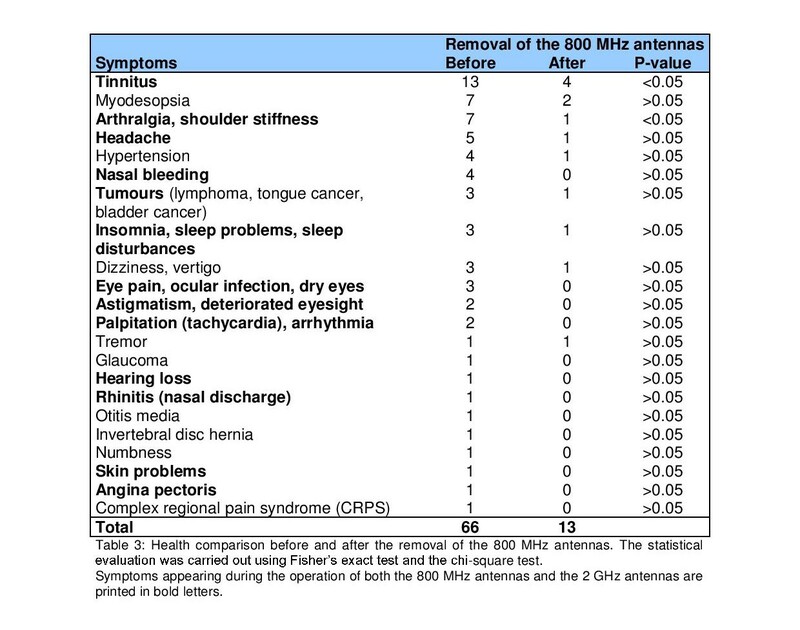 after March 2008 until the first examination in January 2009, were recorded as symptoms possibly affected by radiation emitted from the 2 GHz antennas. After receiving a request from the condominium association board members, the mobile phone company operating the antennas undertook power density measurements of the RF-EMFs emitted by the mobile phone base station. Two technicians employed by the mobile phone company conducted the measurements. The measuring device was an SRM-3000 (Narda Safety Test Solutions GmbH, Sandwiesenstrasse, Pfullingen, Germany). The technicians did not explain in detail to the residents how the measurements were taken. Figure 3 shows the 15 places where power density was measured. Three locations were assessed on the roof of the condominium and one on the balcony of the top (tenth) floor. Three rooms and the entrance area on that floor were also assessed, as were the entrance areas of rooms on the 8th, 6th, 4th, and 1st floor, the ground floor entrance area of the condominium and two locations within the parking lot. Before each measurement, the technicians called the operation centre. A few days later, the results of the measurements were sent to the board members of the condominium association. 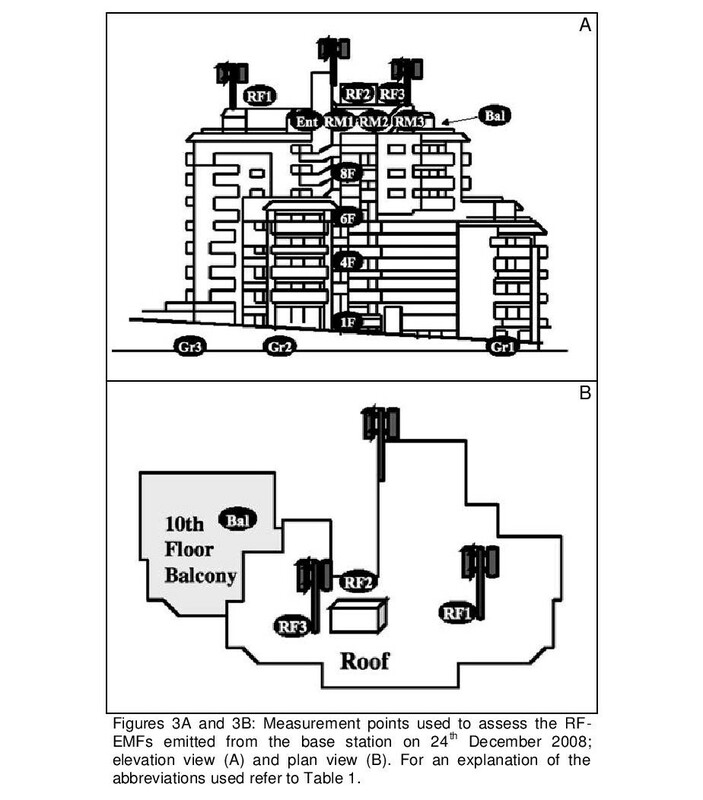 Two technicians from the mobile phone company measured the power densities at 15 different locations around the condominium to assess RF-EMF emissions from the mobile phone station on 24th December 2008 (Figures 3A and 3B). The RF-EMFs from the 800 MHz and 2 GHz antennas were measured and recorded separately. Table 1 shows the results of the measurements, which were between 0.0001 and 0.0286 μW/cm2 (equivalent to 0.02 to 0.28 V/m). 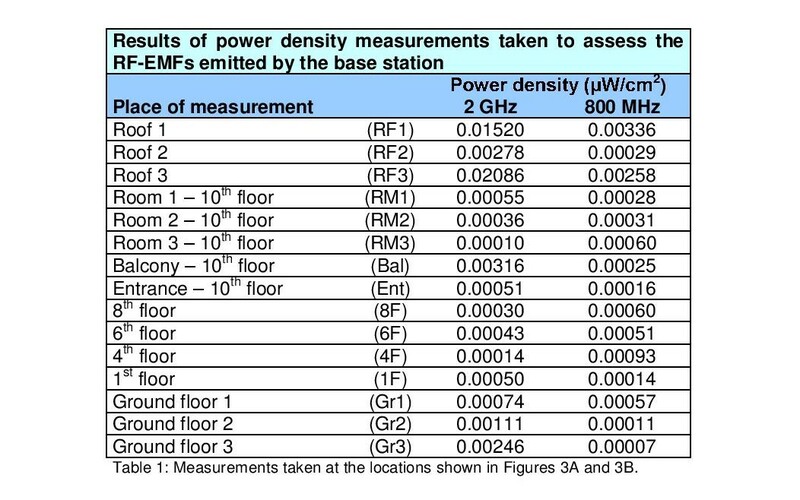 The measurements taken at RF1 and RF3 indicated a relatively high power density. Interestingly, the power density measurements for the 2 GHz antennas showed lower values on the roof (RF2: 0.00278 μW/cm2) than on the balcony (Bal: 0.00316 μW/cm2). The distance between balcony and antenna was only slightly greater than the distance between RF2 and antenna. This result could be attributed to the fact that RF2 was behind the location of the base station’s ancillary operational equipment. The health examinations were conducted twice – in January 2009 and in November 2009 – among 107 out of 122 residents. This represented a participation rate of 87.7 %. 56 participants were male and 51 female. The average age was 37.2 years for male and 38.6 years for female participants. The average time period of RF-EMF exposure from the 800 MHz antennas was 5.60 years for the males and 6.64 years for the females. Regarding the 2 GHz RF-EMF exposure, the average exposure period was 11 months for both male and female residents. Table 2 provides an overview of the residents’ age and gender distributions, as well as the periods of exposure time. 34 residents said they had health problems after the 800 MHz antennas had been installed. 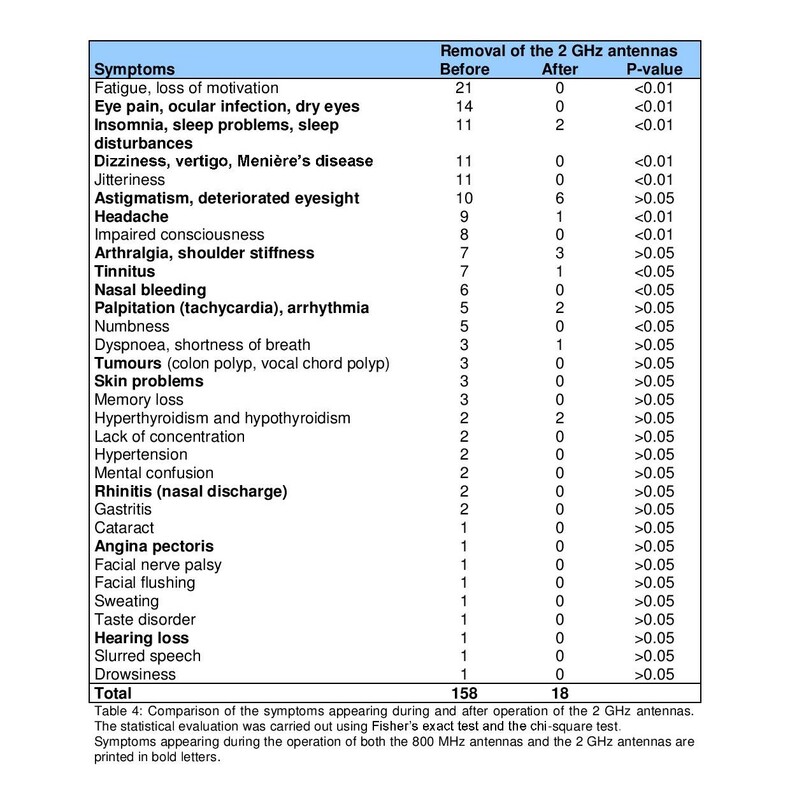 They mentioned 66 individual symptoms, which are listed in Table 3. The health problem symptoms included: tinnitus, myodesopsia, arthralgia, shoulder stiffness, headache, and nasal bleeding. For tinnitus and arthralgia, the difference was shown to be statistically significant. After installation of the 2 GHz antennas, 41 individuals showed symptoms. 26 of these 41 participants had already exhibited symptoms after installation of the 800 MHz antennas. The subjects mentioned a total of 158 cases of symptoms. These are documented in Table 4. The most frequent symptoms were fatigue and loss of motivation, eye pain, astigmatism, deteriorated eyesight, insomnia, sleep problems, sleep disturbances, dizziness, jitteriness, tachycardia, palpitation, numbness and others. 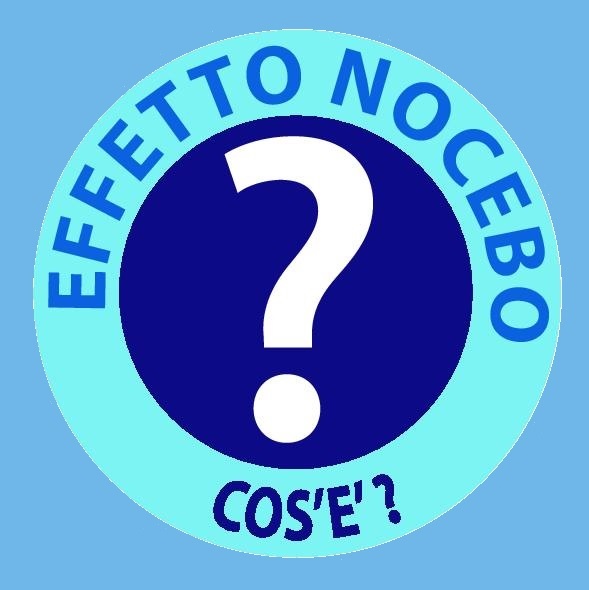 The number of these symptoms – except for astigmatism, deteriorated eyesight, tachycardia, and palpitations – decreased significantly after the removal of the mobile phone station. The symptoms that were recognised during the operation of both the 800 MHz and the 2 GHz antennas are printed in bold font. Health problems that appeared after the installation of the 2 GHz antennas were greater in number than those appearing after installation of the 800 MHz antennas. 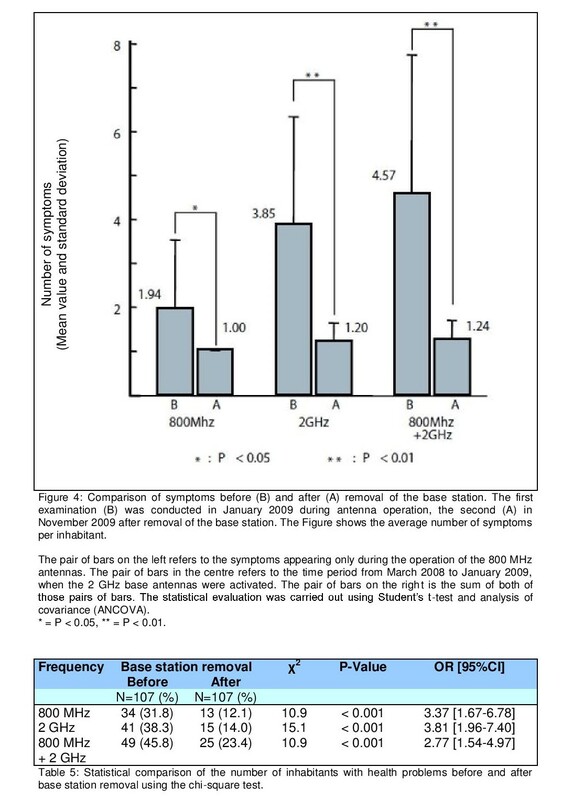 A comparison of the number of symptoms before and after removal of the mobile phone base station shows significant differences. A total of 34 residents suffered from health problems after installation of the 800 MHz antennas. Three months after their removal this number decreased to 13. There were 41 residents who had health problems after installation of the 2 GHz antennas, and this number decreased to 15 after removal of the 2 GHz antennas. In total 49 residents suffered from health problems during operation of both the 800 MHz and the 2 GHz antennas. However, this number decreased to 25 after removal of both sets of antennas. These results showed significant differences using the chi-square test (Table 5). The power density values read by the mobile phone company are extremely low, suspiciously low, compared with measurements taken near other base stations (Abdel-Rassoul et al. 2006). Furthermore, the power density was measured only once by the mobile phone company, whereas this kind of measurement should be conducted several times. Although the power density, as measured by the mobile phone company, was too low to be considered relevant in aggravating the health problems experienced by residents, we have used these measurements as reference levels in this case study. The RF-EMF values were highest at RF1 and RF3, two locations adjacent to the antennas. The RF-EMF power density values at RF2 were lower. It is possible that RF2’s location behind the shelter accounts for these lower values. The power density of Bal, the balcony on the 10th floor, was higher than the power density at RF2. Theoretically, the RF-EMFs emitted from the antennas are not directed vertically downwards. However, it is likely that RF-EMFs were emitted downwards in the form of a side lobe. The power density measurement values clearly indicated that the 2 GHz antennas gave off more energy than the 800 MHz antennas. The number of individual health problems the residents suffered from after installation of the 800 MHz antennas was 66, and rose to 158 after installation of the 2 GHz antennas. It is possible that the health problems the residents suffered from after installation of the 2 GHz antennas were related to their high power output. This health investigation diagnosed 34 residents with health problems appearing during operation of the 800 MHz antennas; out of these residents, 26 suffered even worse health problems after the installation of the 2 GHz antennas. Considering the fact that these residents had already recognised their health problems as related to the 800 MHz antennas, they could possibly have become more sensitive to RF-EMFs emitted from the 2 GHz antennas. Hypersensitisation could have occurred among these residents. The incidence of health problems among 26 residents out of 34 is apparently more frequent than that of electromagnetic hypersensitivity (EHS) patients (Hillert et al. 2002, Johansson 2006, Kato & Johansson 2012, Levallois et al. 2002, Schreier et al. 2006, Schröttner & Leitgeb 2008). 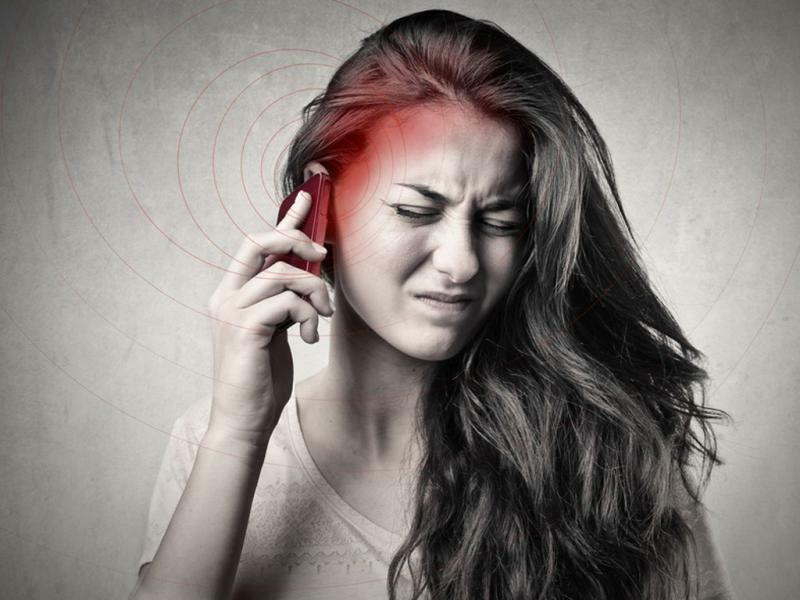 Moreover, it is considered that the acute symptoms could have occurred whilst those residents were exposed to the higher energy of RF-EMFs emitted by the 2 GHz antennas. Recent studies suggest that the pattern and angle of radiation emission, the effects of modulation and the power density all need to be taken into account. An experiment using baboons revealed that the melatonin concentration in the pineal gland decreased significantly while the baboons were exposed to different modulations of EMF in a sudden onset/offset environment (Rogers et al. 1995). Furthermore, a report examining the stress hormone levels of residents living close to a mobile phone base station showed that an abnormal amount of stress hormones was secreted over the period of one year (Buchner & Eger 2011). Because of such findings, it is important to conduct longitudinal studies on stress hormone secretion under the influence of RF-EMFs. Our research examines symptoms from the installation of the 800 MHz RF-EMF emitting antennas up to the period after their removal, a total time of 11 years. Examining long-term changes of the residents’ health problems has enabled us to prove that the residents’ health showed significant differences before and after the removal of the mobile phone base station. In 2000, the European Commission decided to adopt a precautionary approach as a basic principle in environmental issues. 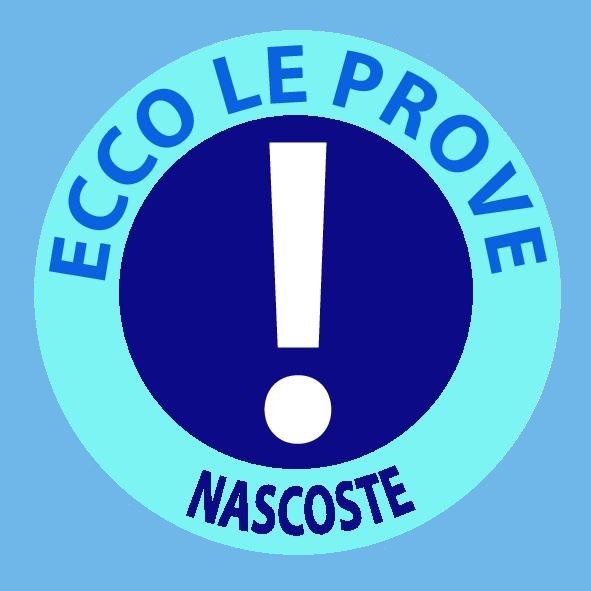 In this decision, the EU pledged to take precautionary measures to deal with environmental issues, so that irreversible consequences could be anticipated even if the risk was not scientifically proven European Union (2010). However, the Japanese Government has issued an Electromagnetic Wave Protection Guidance which states that RF-EMFs do not affect health if they are below 1000 μW/cm2 in the 1800 MHz to 5 GHz frequency range. (MIC 2011). The value 800 MHz range permitted by the Japanese Government is 530 μW/cm2 calculated by the following formula: f (MHz)/1500 (between the frequency is 800 to 1500 MHz) (MIC 2000). As a result, an increasing number of mobile phone towers and base stations have been erected, without any regulation, on the roofs of condominium buildings. Moreover, media coverage of non-ionising radiation is in Japan much rarer than in Europe and the USA. Because of this, it is difficult for this issue to be recognised by the Japanese general public. Our intention was to examine whether there were health impacts on residents from RF-EMFs emitted by the mobile phone base station erected on the roof of their condominium building. We conducted thorough research on whether there were any other factors to account for the improvements of the residents’ health other than the removal of the base station. The results of this case report indicate that health problems of the residents were associated with the operation of the mobile phone base station and that these problems improved after its removal. Although this report is not a double-blind study, it can be used as an example indicating the potential effects of RF-EMFs emitted from mobile phone base stations erected on the roofs of condominium buildings on human health. It is imperative that further detailed research is conducted regarding the impact of RF-EMFs on human health. This research and the corresponding data collection were conducted without outside funds in order to maintain neutrality and avoid pressures from external sources. The original translation into the German language was made possible by a donation from the registered association “Netzwerk Risiko Mobilfunk Oberfranken e.V. (NRMO)” (= “Network Risk of Mobile Telephony in Upper Franconia”) (for further information please refer to: www.mobilfunk-oberfranken.de). Abdel-Rassoul, G., Abou El-Fateh, O., Abou Salem, M. et al. (2007), Neurobehavioral effects among inhabitants around mobile phone base stations. Neurotoxicology, 28(2), 434-440. Berg-Beckhoff, G., Blettner, M., Kowall, B. et al. (2009), Mobile phone base stations and adverse health effects: phase 2 of a cross-sectional study with measured radio frequency electromagnetic fields. Occupational and Environmental Medicine, 66(2), 124-130. Blettner, M., Schlehofer, B., Breckenkamp, J. et al. (2009), Mobile phone base stations and adverse health effects: phase 1 of a population-based, cross-sectional study in Germany. Occupational and Environmental Medicine, 66(2), 118-123. Buchner, K. & Eger, H. (2011), Changes of Clinically Important Neurotransmitters under the Influence of Modulated RF Fields – A Long-term Study under Real-life Conditions (Original scientific publication). English translation of: Buchner, K. & Eger, H. (2011), Veränderung klinisch bedeutsamer Neurotransmitter unter dem Einfluss modulierter hochfrequenter Felder – Eine Langzeiterhebung unter lebensnahen Bedingungen (Wissenschaftlicher Originalbeitrag), Umwelt-Medizin-Gesellschaft, 24(1), 44-57. Dode, A.C., Leão, M.M., Tejo, F. de A.F. et al. (2011), Mortality by neoplasia and cellular telephone base stations in the Belo Horizonte municipality, Minas Gerais state, Brazil. Science of The Total Environment, 409(19), 3649-3665. Eger, H., Hagen, K.U., Lucas, B. et al. (2004), The Influence of Being Physically Near to a Cell Phone Transmission Mast on the Incidence of Cancer. Original scientific study. English translation of: Eger, H., Hagen, K.U., Lucas, B. et al. (2004), Einfluss der räumlichen Nähe von Mobilfunksendeanlagen auf die Krebsinzidenz, Wissenschaftliche Originalarbeit. Umwelt-Medizin-Gesellschaft, 17(4), 326-335. European Union (2010), Notice Number 2010/C 83/01: Consolidated versions of the Treaty on European Union and the Treaty on the Functioning of the European Union, Official Journal of the European Union C 83, 53, 132. Hillert, L., Berglind, N., Arnets, B.B. & Bellander, T. (2002), Prevalence of self reported hypersensitivity to electric or magnetic fields in a population based questionnaire survey. Scandanavian Journal of Work, Environment & Health, 28(1), 33-41. Hutter, H.P., Moshammer, H., Wallner, P. & Kundi, M. (2006), Subjective symptoms, sleeping problems, and cognitive performance in subjects living near mobile phone base stations. Occupational and Environmental Medicine, 63(5), 307-313. Johansson, O. (2006), Electrohypersensitivity: state-of-the-art of a functional impairment. 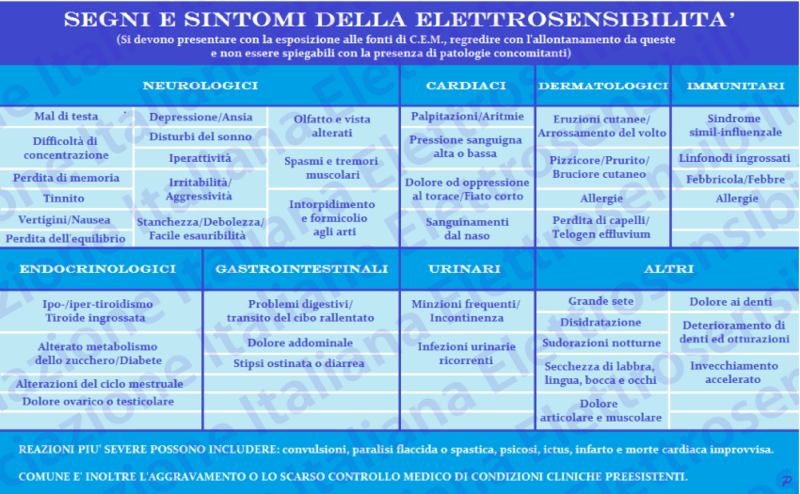 Electromagnetic Biology and Medicine, 25, 245-258. Kato, Y. & Johansson, O. (2012), Reported functional impairments of electrohypersensitive Japanese: A questionnaire survey, Pathophysiology, 19(2), 95-100. Khurana V.G., Teo, C., Kundi, M. et al. (2009), Cell phones and brain tumors: a review including the long-term epidemiologic data. Surgical Neurology, 72(3), 205-214. Levallois, P., Neutra, R., Lee, G. & Hristova, L. (2002), Study of Self reported hypersensitivity to electromagnetic fields in California. Environmental Health Perspectives, 110(Supplement 4), 619-623. MIC (2011), Radio Radiation Protection Guidelines for Human Exposure to Electromagnetic Fields, Japan Electromagnetic fields (EMF) Information Center, Ministry of Internal Affairs and Communications of Japan (MIC). [http://www.jeic-emf.jp/assets/files/pdf/aboutus/JEIC_Guide%28eng%29.pdf, accessed: 15th October 2014]. Navarro, E.A., Segura, J., Portolés, M. & Gómez-Perretta, C. (2003), The Microwave Syndrome: A Preliminary Study in Spain. Electromagnetic Biology and Medicine, 22(2-3), 161-169. Rogers, W.R., Reiter, R.J., Smith, H.D. & Barlow-Walden, L. (1995), Rapid-onset/offset, variably scheduled 60 Hz electric and magnetic field exposure reduces nocturnal serum melatonin concentration in nonhuman primates, Bioelectromagnetics, 16, Supplement 3, 119-122. Santini, R., Santini, P., Le Ruz, P. et al. (2003), Survey Study of People Living in the Vicinity of Cellular Phone Base Stations. Electromagnetic Biology and Medicine, 22(1), 41-49. Sato, Y., Akiba, S., Kubo, O. & Yamaguchi, N. (2011), A case-case study of mobile phone use and acoustic neuroma risk in Japan. Bioelectromagnetics, 32(2), 85-93. Schreier, N., Huss, A. & Röösli, M. (2006), The prevalence of symptoms attributed to electromagnetic field exposure: a cross-sectional representative survey in Switzerland. Sozial- und Präventivmedicine, 51(4), 202-209. Schröttner, J. & Leitgeb, N. (2008), Sensitivity to electricity – Temporal changes in Austria. BMC Public Health, 8, 310. Wolf, R. & Wolf, D. (2004), Increased incidence of cancer near a cell-phone transmitter station. International Journal of Cancer Prevention, 1(2), 1-19. Real. Microwaves seriously damage human health.